A transportation and logistics company which provides over the road transportation, logistics, freight management and warehousing solutions to a variety of customers and industries has a credit facility with a bank that is acquired and the facility is not renewed. The Company is struggling to secure new financing and its conversations with multiple traditional lenders and a variety of finance companies are unsuccessful. After being introduced to the Company, Concord’s assessment of the situation is that the Company is financeable due to its collateral coverage, recent financial performance and experienced management team. The Company subsequently retains Concord to search for and secure new financing. 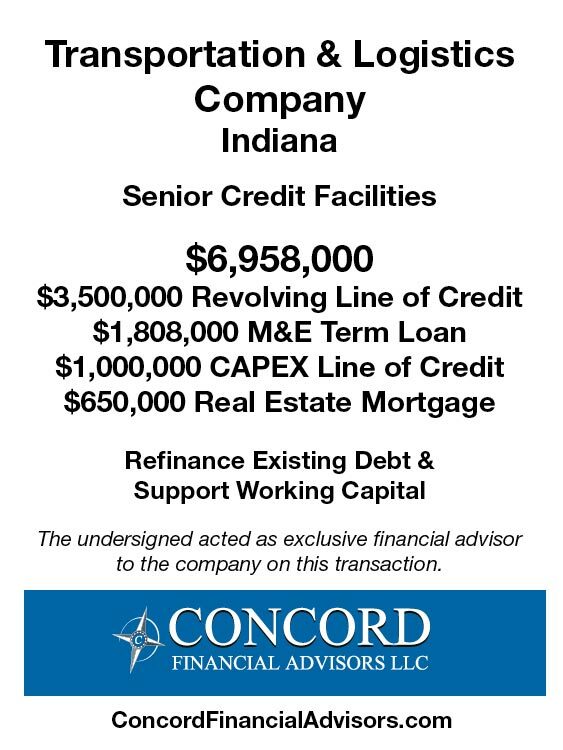 Concord quickly identifies the three most appropriate lenders for the Company’s credit profile and secures a traditional bank asset-based credit facility for the Company including a $1,000,000 million Capex line to purchase new M&E and upgrade its fleet of tractors. Concord also secured additional incremental liquidity via a SBA 7(a) loan against the Company real estate.